Steve telling Cheryl not to be too upset about the outcome of the auction. Roz Kemp telling Philip that his short story was based on other people's books. Darren being accused of shoplifting. KARL: I imagine they'll want to do the place over straight away. A bit of renovation... certainly a fresh coat of paint. KARL (smiles): Well, I'm certainly not going to finalise the deal unless *you're* there to sign the papers. CHERYL (exclaims in shock): *You*? KARL (nods): Mmm. And Susan. We thought it was time to expand our investments. I must say, we're very happy with our buy. You *could* say ‘we're in the pink' about it! Cheryl stands there looking horrified. CHERYL: Well, that's *one* thing, I suppose. MARLENE (chuckles): I *knew* you'd be thrilled! 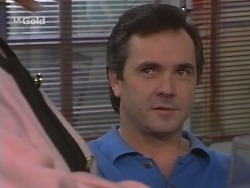 CHERYL (darkly): The only thing that would thrill *me* would be Karl Kennedy heading towards an open manhole! MARLENE: Oh, so everything's *not* OK. You and Karl have been at each other for *ever*. It's always been something trivial. CHERYL (exclaims): *Trivial*? The man bought my *house*! She adds in horror that she's never seen a man gloat so much. The ‘phone starts ringing suddenly and Cheryl picks it up. She listens as a police sergeant talks to her, and she tells him that she'll be right there. 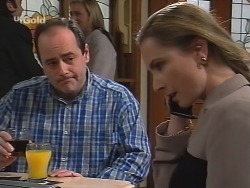 She then hangs up and tells Marlene that Darren's been arrested for shoplifting. Libby is working at the computer, muttering about her homework being difficult. She tells Karl that she can't understand some of the big words in her assignment. Karl assures her that he's always there to help, even when he gets mad at her. Libby takes the opportunity to tell him that he doesn't have to *love* Darren, but it would be really nice if he could *like* him just a little bit. Karl, however, retorts that Darren is trouble – and he's prejudiced against him because of concern for *her*. He then offers to promise to keep his thoughts to himself until Darren has had a chance to prove him wrong. DARREN: And then he shoved the CDs into me and ran off, and the security guard turned around and there I was, standing there with the CDs and the alarm was going off. Back at No. 24, Cheryl is telling Marlene that if Darren gets out in the morning, nobody need know about this, and then all she has to worry about is the bail being kept under $1,000, because the kitty's getting very low. There's suddenly a knock on the front door and Cheryl answers it to find Libby standing on the step. She asks her awkwardly what she can do for her. Libby explains that she wanted to tell Darren that her dad has agreed to back off and let him prove himself. 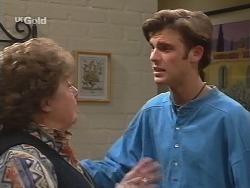 Cheryl tells Libby quickly that Darren's out. Marlene, however, chips in that that Libby deserves to know the truth. Libby asks her what she means. Marlene explains what's happened. Libby stands there looking shocked. 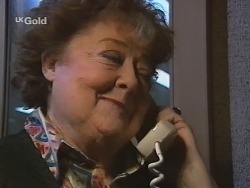 A few moments later, Libby is telling Cheryl that she wants to go and see him. Cheryl says she knows, but he's very upset and seeing Libby like this would just make him feel worse. Marlene adds that Cheryl's right: Darren has enough on his mind without worrying about *them*. Libby cries at Cheryl that she should have told her straight away. Cheryl retorts that she wanted to see if she could sort things out before she had to, because she doesn't want people jumping to conclusions. She adds that she really doesn't think they should be telling *anyone* about this – especially Malcolm: if Darren's ever going to get his life together again, that job is all he's got. She points out as well that they need to keep it from Karl: Darren's not got much chance of getting him on- side if he ever found out. SUSAN: When you first told her we'd bought the house? When you told her your plans to redecorate? Or when you ran through the list of faults that the building inspection threw up?! SUSAN (pointedly): But we wouldn't want to pre- judge him, would we...? Karl says he's just going to sit back and wait for things to go wrong! Libby joins them and says flatly that she's got to go. Susan asks her if she's OK. Libby mutters that things couldn't be better. She heads out, leaving Susan to ask Karl what all *that* was about. Marlene is talking to a Sergeant – Sergeant Richardson – saying to him that she remembers how kind he was to her when *she* was in there; she hopes he's giving her grandson the same treatment. The Sergeant retorts that he's being treated the same as everyone else. The two of them head through into a secure area as the Sergeant adds that Darren broke his parole and will be getting no favours. He tells Marlene that she's got ten minutes. In the room with Darren on the other side of a pane of glass, Marlene picks up the ‘phone and tells Darren that it's good to see him. Out in the main office, Libby walks into the station and tells Sergeant Richardson firmly that she'd like to see Darren. The Sergeant asks her who she is and she tells him that she's Libby Kennedy – his girlfriend. The Sergeant tells her that Darren's already got someone with him – his grandmother. Libby says she'll wait. The Sergeant tells her that he'd prefer she didn't. Libby asks if she can see him tonight. The Sergeant retorts that his shift will have finished by then, so she can ask someone else – and whoever it is, he hopes they're having a better day than *he* is. Libby stands there looking astonished. LIBBY: So he could be getting out *today*? CHERYL (nods): The moment I pay the bail. LIBBY: Oh, I can't go to school while all *this* is happening! LIBBY: It's a lot, isn't it...? PHILIP: My heart was in that short story. Anything you say now will pale in comparison. Hit me with it! ROZ (sympathetically): I think that's the problem: your heart wasn't *in* this one. 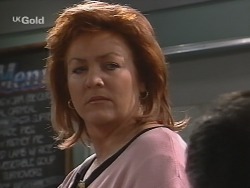 ROZ: I don't suppose you'd be interested in some accounting work?! PHILIP: Well, I'm busy trying to be a *writer* at the moment! Roz heads out, leaving Philip sighing heavily. PHILIP: The truth is I don't want to write anymore. My last novel was a real effort. You're just letting me off the hook. ROZ: I *was* going to suggest that you submit it to another publishing company. ROZ: You know finances very well? ROZ: Enough to throw your hat in the ring as our new Business and Marketing Manager? PHILIP (looking surprised): You serious? ROZ: We need help. The firm's finances are a complete shambles. The accountant we've had for the past year has lost us a fortune. PHILIP (warily): Well, with Helen in hospital, it might not be a good time to take on something so big. ROZ: It's quite common to work from home these days. What if we hooked up a fax and a modem for you? PHILIP: Then I'd probably consider it. ROZ (smiles): Good! I expect to receive your résumé in the morning! CHERYL: Sorry – do I understand that I can't see my son because you're overworked? Could I see your name, please? SERGEANT RICHARDSON (mutters): He's been nothing but trouble since he got here. SERGEANT RICHARDSON: He's broken parole. I have a job to do, as set out by the courts, and I will *do* it. CHERYL (retorts): And *I* have a right to see my son. CHERYL: My son is being held in one of your cells for something he didn't do. He has no right to be treated like this. SERGEANT RICHARDSON (sarcastically): Believe it or not, he's not the *first* person we've had here who has protested their innocence. LIBBY: He's telling the truth. Why can't you just leave him alone?